Venus' Adventures in Loom Knitting – Page 2 – Loom knitting projects, tips, patterns, reviews, and advice. A few months ago, I made a green triple stitch scarf. My friend wanted a scarf in olive green or forest green, so I tried to find a happy medium between the two. I think I used Joy DK yarn by Loops & Threads in “Leaf” green. The stitch pattern comes from Loom Knit Stitch Dictionary by Kathy Norris. It is published by LeisureArts. They are the makers of the Oval Loom set. If you google triple stitch or triple knit, you are going to find other stitch patterns, just a warning. Ms. Norris does say that some people call this stitch the “chunky braid stitch”. This stitch pattern is designed to look similar to a knit stitch, but you’ll see a strand of yarn running horizontally behind the loops. For some reason, my scarf didn’t quite come out like the picture in the Loom Knit Stitch Dictionary. I think I needed to use a worsted weight yarn. My loom was a small gauge, but would’ve worked better with a #4, the yarn in the pictures is DK weight. The Triple Stitch is an easy stitch to learn. If you can e-wrap, you can do this one. It’s a good beginner stitch because you don’t need to know how to purl. I made the scarf on my KB Loom Knitting Basics loom (the 32-Peg Basic Loom is also sold separately if you don’t want the kit). You can make this scarf on a small gauge loom or use a thicker yarn and make it on a wide gauge. All you need is a loom that has as least 24 pegs. The scarf was about 20-22 pegs across. I think I used 20, but I can’t remember. I used the triple stitch all the way across and back. I did not neaten the edges by doing a single knit stitch on the ends. Some knitters like a smoother edge, so they will make the first and last stitch on a row a knit stitch. Here you can see the front and back of the knit stitch pattern. The left side is the knit side. I think I need a little more practice with this stitch to make it come out neater and more professional looking the way it does in the book. But it was fun to try out a new stitch. Next time, I’ll pay a little closer attention to the yarn weight! Please check back soon for a review of the Loom Knit Stitch Dictionary. Oh, and if you missed my review of the KB Loom Knitting Basics loom, here it is. What is your favorite type of knit stitch pattern? My Baby-Knit Looms from Authentic Knitting Board came in this past week! I was very excited to try them out. Sometimes it is hard to gauge whether you need to use a 24-peg loom or a 31-peg loom when making baby hats (or how many pegs to use on a small-gauge loom like the All-in-One), so this loom takes the guesswork out of the process of making baby hats and baby booties. As you can see from the photos, the set comes with a 56-peg loom in a sea-green/blue-green color and a small 24-peg loom in purple. The sea-green loom is designed for infant hats and the purple loom is for baby booties. Both looms are 3/8″ gauge, so you can use one strand of thin yarn. The booklet suggests one strand of #3. You’ll also find a knitting hook and a booklet that offers basic instructions, which includes one hat pattern and one baby booties pattern. The booklet covers basic stitches: e-wrap, true knit, purl, and u-knit and shows you methods for casting on and binding off. The instructions are written in English and in French (sorry, no Spanish). According to the booklet, a hat made in true-knit or u-knit will fit infants 0-6 months and e-wrap will fit 6-12 months (up to a 17.5″ circumference). The first thing I noticed when handling these looms is that they are sturdy. The plastic is dense and the quality is good. I tried pulling on some pegs and they are very securely attached, but they have enough give to bend a little. They don’t feel cheap like my Boye looms. They feel heavier, too. Surprisingly, the material feels very soft in the hand. I think it might take me a minute to get used to the weight, but I’m very impressed with the quality. I have never been disappointed in the quality of any KB loom I’ve purchased. One plus of this yarn is that you can use a fine baby yarn for a more delicate look (like you’d get with needle-knit or crochet). Of course you can double or triple a thin yarn, but this loom allows you to use one strand, which is nice if you don’t want your hat to feel too thick, such as for a newborn hat in the summertime. The gauge is pretty narrow. I think it might be a little smaller than my KB Basics 32-peg loom, but I’d have to measure to be sure as KB doesn’t list the gauge for on the 32-peg loom on their website. When I got the Baby-Knit Looms, I didn’t have a #3 yarn handy except for a wool yarn I didn’t want to use, so I knitted with a Caron soft #4 and that worked. So far, I like the loom and as mentioned, I think one of the big selling-points of this loom is it takes the confusion out of making baby sets. For beginning knitters, if you don’t have an exact pattern you’re working from that calls for a specific size of loom, it can be a little confusing to know whether you should use a 24-peg or a 31-peg loom. I like that this loom can make hats for babies up to 12 months and all you need to do is change the stitch to make the hat smaller or larger. For babies older than 12 months, you’d need to use a wide gauge 31-peg loom or you can make it on the All-in-One loom. Here is a link to some of the baby patterns on the KB website. Right now, KB has 3 patterns for the Baby-Knit Loom. I would give this loom 4.5 stars. It’s sturdy and well-made, it takes the guesswork out of sizing, and it is very affordable. I’d like to see more patterns for it, but the product is new and I’m sure designers will start coming up with more adorable baby sets to suit this loom. *Disclosure: I purchased this loom set and did not receive any compensation for this review. All opinions are my own. This post does include affiliate/advertising links. One Year of Loom Knitting! It’s been one year since I started knitting my first garter stitch scarf from a pattern on a Loomahat video. Since then, I’ve made roughly 30 projects. Most were scarves, hats, or scrubbies. The easiest were my garter stitch scarves, the scrubbies, and the double-knit stockinette scarf I made. The hardest was a criss-cross stitch double-knit scarf. The pattern is beautiful, but it’s a challenge to follow if you aren’t experienced with loom knitting and most of the videos out there are confusing to follow. At some point, I hope to write a post about the criss-cross stitch. My present to myself for the holidays this year is a Baby Loom set from Knitting Board. It’s called “Baby Knit Looms” and right now you can find it on Amazon, JoAnn.com, or the Authentic Knitting Board website. I don’t have any kids, but I just love seeing other loomers make baby sets. They are so adorable! This loom ranges from $11-$15, depending if you catch it on sale. You can make baby hats and baby booties with it. This week, I downloaded a book from loom knitter, Scarlett Royale. She has some of her animal knit patterns available as an ebook on Kindle Unlimited. If you like ebooks, Kindle Unlimited is a monthly subscription (like Netflix or Hulu) that allows you to pay a flat monthly fee to read thousands of books. You can only check out so many at a time, but it’s a good way to try something out before you buy. Scarlett’s 50 Loom Knitted Stuffed Animal Pattern Collection is normally $30, so this will allow me to try out a couple of patterns and make sure I like them before I buy the whole book. I’ve also had my eye on Pat Novak’s Knitting Board Basics book. I think it’s a beginner’s guide, but I like collecting loom knitting books for reference. I told my honey if anyone asks what to get me for Christmas to get me this or the KB Round Loom set. For those who were following along with my previous posts, I just had my second surgery and all seems to be healing well, so I hope to post more in 2019. My goal is to put up some book reviews and link to more patterns and loom knitting tips. Have a very happy and healthy holiday season and I’ll see you guys soon! Tell us: what’s on your knitting wish list? Sorry I haven’t posted for a while. I had my surgery in July, which went well, but during the procedure, they discovered another condition, which means I’ll be needing another surgery. If all goes well, I’ll have my second surgery this year. So I’ve been a bit distracted and haven’t been posting. Since I my last post, I did finish my friend’s green triple knit scarf and I started another scarf in the loops & threads Barcelona yarn, but I’m not sure what the pattern’s name is called. I also made some pretty purple scrubbies for a friend’s birthday using lavender purple cotton yarn and sparkly white/clear scrubby yarn. I don’t have any pictures to post right now, but I don’t want to leave without sharing something with you all, so I’m going to share some loom knit doll patterns! 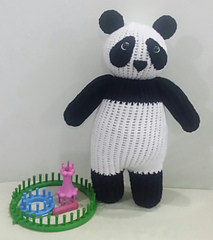 There’s a woman in my online knitting group who makes very cool loom knit dolls in all kinds of shapes: puppies, unicorns, monkeys, zebras, sheep, birds, and more! She has many designs on Ravelry, so please check out some of her awesome work. 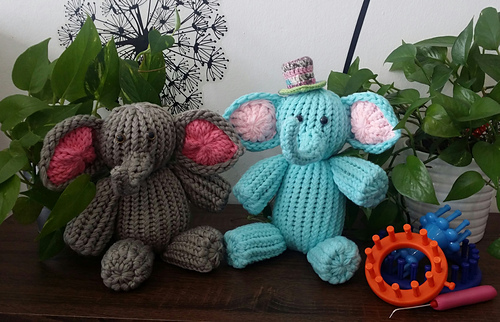 Here’s another one of her patterns for adorable elephants! I really love her work and I hope you’ll enjoy these patterns, too. Christie lists all the looms and types of yarn you’ll need for each pattern. As you can see in the two pictures above, she’ll also include the looms she used in the picture on each pattern so you know what type of loom she’s referring to. I hope you are all well and that you had a great summer. I’d love to hear what you’ve been working on. Feel free to post about your projects in the comments. Yesterday, I went to the local second-hand craft store and picked up 4 circular knitting needles and a book on circular knitting for $15. This might be very brave and stupid or brilliant – time will tell. I figured if I’m going to be in bed for 2 weeks recuperating from surgery, maybe I’ll have the patience to watch a few videos and attempt a simple circular knitting project. The couple of times I tried to learn traditional knitting, I couldn’t figure out casting on and doing the first row and just gave up. I probably would’ve done better if I’d had someone guide me through it rather than trying to follow along with a book. But now there is YouTube! I learned loom knitting on YouTube, so maybe I’ll have some luck with learning circular knitting as well. We’ll see how much patience I have since traditional knitting is more time consuming than loom knitting. It already takes me a few days to knit a scarf on the loom. 🙂 I like the ease of loom knitting and that it’s not as stressful on my hands/arms. I think I will need to bring out the wrist braces for this experiment. Have you tried traditional circular knitting? If you knit on a loom and also knit with circular or straight needles, which do you like best? I bought the Knitting Board All-in-One Loom several months ago, but didn’t have a chance to play with it until April. The All-in-One Loom is designed to be a single loom that can accomplish multiple projects of different sizes – hats, scarves, blankets, socks, baby clothes and various double-knit and round-loom projects. The loom is 18 inches and is set up with wooden spacers, bolts, washers, and nuts so that you can adjust the spacing of the loom. You can use the really small spacers for double-knits, and you can use the larger spacers with pegs on them for knitting in the round or for doing blanket panels. The loom has a smaller gauge than the typical inexpensive, plastic looms you might buy from your local craft store or Amazon. You can knit hats and scarves without having to double your yarn (unless you’re using a fine yarn). A single strand of #4, worsted-weight yarn works great. The All-in-One is long, so turning it and knitting the little spacer pegs can be a bit awkward until you get used to it (especially if you’re making a smaller item where you have to reach in between the long side pieces to get to the spacer that’s in the middle. Check out the pictures below. I’ve positioned the spacer as if you were making baby booties or something really small. So far, I’ve made a double-knit scarf and a basket-weave hat on the All-in-One loom. Overall, I like it, though initially, I didn’t like that there were only two of the small spacers. The small, skinny spacer juts out a little no matter which direction I install it and depending on where you place these spacers, your loom may wobble, especially if you’re knitting on a table or desk rather than in your lap. I asked Knitting Board if it was possible to order an extra spacer to make the bottom of the loom more balanced (they did oblige me and I was able to get two more small spacers). I just need to buy the extra bolts and nuts for them from the hardware store. Here is an example of how the small spacers jut out at the bottom when you’re using them for double-knitting. This happens even if I turn them in the other direction where they are wider rather than taller. Oh, I should also mention: when you first change the loom size, it might be hard to get the bolts out. To get my bolts out, I set the loom on its side with the tail/screw end of the bolt on the table and the head of the bolt in the air. I then rock the loom a little and tap it against the table and then the bolt pops out. You could potentially use a hammer or other object to gently tap on the bolts to loosen them from the wood. Just be careful not to damage the loom. I think the loom is a good buy if you can’t afford to get lots of different looms or you have space constraints and you want one loom that does almost everything. Or if you prefer a small gauge loom and don’t mind the length. Those with severe arthritis or other dexterity issues might have a harder time with the loom because of the narrow gauge and the awkward size. Quality-wise, the loom is good. I really like Knitting Board’s looms because they are sturdy, easy to assemble and they are well-constructed. Overall, I do like the All-in-One loom and will consider it a staple in my collection, but for smaller items, I like my Knitting Board Basics loom because it is more portable, easy to hold in your hand and I don’t have to worry about it wobbling if I’m using a small spacer. I think the basics loom is the same as the 10-inch loom (if you don’t need the booklet and crochet needle). I also have the adjustable hat loom, which is lighter and while it’s also fairly long, it’s a little easier to manipulate when working in the round. Rating: I give this loom 4.5 stars. *Disclosure: I purchased this loom and did not receive any compensation for this review. All opinions are my own. This post does include affiliate/advertising links. Sorry it’s been a little while since I’ve posted. I’ve been dealing with a health issue and there was a flurry of activity recently as my 40th birthday just passed. On the plus side, two of my friends got me a book on loom knitting afghans and I bought the Knitting Board Double-Knit Rotating Loom with an Amazon gift card I got on my birthday. I did work on a few projects in April and May. In April, I was mostly trying to figure out how to do the Criss-Cross stitch, which is a double-knit pattern for the loom. I made a short, round scarf and I’ve started working on a bigger multi-colored scarf in this pattern. I hope to post a pattern review and links, but this one is complicated, so it might take me a while to put it up. Here’s a close-up of the basket-weave hat. The lighting doesn’t show all of the shifts in the pattern. I used a folded over rib stitch for the brim. If you’d like to try the basket weave, I definitely recommend Isela’s book, which you can find on Amazon (click the picture for details). If you just want to learn this stitch, she has instructions for the basket weave in a free loom knitting stitch guide on her blog. Note: Isela also creates patterns for Knitting Board, so if you check out their free patterns on their website, you’ll see a few that she has created. This month, I’m working on a triple stitch scarf for a close friend (who coincidentally also had a birthday the same week as my niece and I). My friend wanted a scarf in either olive green or forest green so I found a nice red heart yarn that was a cross between the two. I’ll probably post pictures of it later once it’s finished. I’m hoping to post a review of the All-in-One loom this month, which is the 18-inch loom by Knitting Board. My posting schedule might be a little sporadic this summer as things are pretty hectic at work and I will be having a surgery in July. I’m hoping I’ll be able to knit as I recuperate! Do you have any exciting projects you’re knitting this summer? Let us know in the comments below. I stumbled across an article a month ago explaining how to make your own knitting looms and I thought that was a cool idea! I was looking for a friend of mine who is just getting into loom knitting (and who has a table saw and woodworking equipment at home). I will admit that cutting wood and sanding is not my forte. That is the domain of my fiancé who is very good at making things like wooden pens, mugs, boxes, bookcases, etc. He’s the one who can look at a piece of wood and know what tree it is from and who can wax on about different types of nuts, bolts, and screws and what you’d use them for. While I am not confident enough with these things to make my own looms, I love the idea that with a few pieces of wood and certain nails or screws that you can have a knitting loom! So I wanted to share some resources with those of you who are far more adventurous than I am. This Instructables tutorial shows you how to make a knitting loom similar to the KB All-in-One loom, where you can adjust the side pieces to the size you want. You can use it to make a hat, socks, or scarves and flat-panel items. What I like about this loom: 1. It is adjustable. 2. The pegs have grooves in them. 3. You can make it in different gauges (there are two versions/instructions for the loom, depending on the spacing you need). There is even a tutorial for making a knitting tool/hook! The only potential drawback I see is that over time, the pegs might get worn down from the loom hook scraping the wood. I suppose you could put some sort of epoxy or finish on the wood to minimize this or just make the pegs replaceable. This tutorial is probably a little more advanced than some of the other tutorials. Knitting Naturally covers making a basic knitting loom with wood and nails. It uses more basic tools, so if you don’t have a fancy table saw and router table or a drill press, you can still get the job done if you have sandpaper, a hammer, nails, wood, and a saw. While the instructions are not too complicated, the only drawback to this tutorial is that there aren’t pictures of what each step looks like, so you’re just reading the instructions. I know some of you are visual learners and need to actually watch someone do each step, so here are some video tutorials that I saw on Youtube which teach you how to make wooden looms. Alison Russell has a tutorial on making a rake loom with wood and nails. Alison Russell’s Craft Channel – How to make a long knitting loom. Rake loom. Note: a rake loom only makes a single-panel item like a scarf or a dishcloth. You wouldn’t be able to knit a hat on this loom as it is. However, you could follow the instructions on one of the other tutorials above and make a second rake and add spacers to be able to make double-knits or hats. She makes each peg with two nails, so the space in between the nails is the “groove” that you’d find on other looms, rather than having to run your knitting tool on the surface of the nail with no groove – or having to use a tool to scrape a groove into the nails. This tutorial shows you how to make a round loom and then how to knit a hat on that round loom. The instructor, Johnny Walshe, uses plywood and cotter split pins. Make sure to read the description of the video as he offers a link to a template to help you make the loom. He doesn’t give the exact spacing for the pegs in the video, so you’d have to decide that for yourself or use his template. Johnny shows you an example of knitting looms made with nails and looms made with the cotter pins (which have an open groove in the middle). I love that he offers various ways to make the loom, depending on what tools you have available. He does it with hand tools and with electric tools. The style of loom he makes is very similar to looms offered by Cottage Looms. If you’re not good with woodworking, but you want a kid-friendly craft project, or if you just want to try making an impromptu loom with household items, this section is for you! In my search, I did see a couple of kid-friendly tutorials on making a knitting loom with things like Popsicle sticks and a toilet paper roll (or similar cardboard tube). These are what I would call french knitter or spool knitter looms. They are designed for small projects or for knitting an i-cord, which you can then work into other projects. This is a kid-friendly and simple tutorial on making a loom with Popcicle sticks and a tube (could be a toilet paper roll or another similar tube). The tutorial is long, but she does show you how to actually knit on the toilet paper loom. She also gives examples of things you can make on this style of loom. The Knit Chat tutorial shows you how to make two looms: 1. a small loom with a toilet paper roll and Popsicle sticks and 2. a loom made out of a plastic bottle/plastic container. I hope that was helpful. And if you’re like me and you love the idea of a wooden loom, but don’t have the patience, or the skill, to make one, you can find wooden looms like this from Knitting Board, Cottage Looms, and CinDWood looms. Keep in mind that wooden looms tend to be more expensive, so a single loom from these companies will run you between $11-$80 depending on the size of the loom. You can find Knitting Board looms on sale at JoAnn, Amazon, and eBay (or you can get 10% off your first order if you sign up for the Knitting Board newsletter and order off of their website). Cottage Looms are sold on Etsy and CinDWood sells on their website. Once in a blue moon you can find a used one on eBay. If you’ve made a loom of your own, please show us a picture in the comments or let us know what you made! So I bought a yarn winder that arrived over the weekend! I’d been seriously thinking about buying one for a couple weeks and ended up getting the Darice yarn winder (which is the same as the Michaels brand Loops & Threads yarn winder). I’d been looking at different styles and brands. I found this post which talks about different yarn winders and picking the right winder for your needs. I was actually thinking about Windaze knockoff or a Lacis yarn winder, but since my budget was limited and I couldn’t get the jumbo Lacis that I would’ve wanted, at the last minute, I decided to get the Darice / Loops & Threads yarn winder from Amazon. I looked at a few youtube reviews and tutorials like this one. Initially, I was worried about the winder because there were a few negative reviews on the Michaels website. But after looking at youtube reviews and tutorials, I was fairly sure of what to expect and how to make the winder work for me. Yarn winders operate similarly to the way a bobbin winder works on a sewing machine. There’s a tension guide that you feed the yarn through and you have to wrap your yarn around the shaft of the yarn winder a couple of times and then you just crank it and the little metal yarn holder/tension guide moves back and forth until the yarn fills up. To use this winder, you need to 1. Put your yarn through the notch on the plastic brim of the winder. 2. Wrap the yarn around the shaft a couple times 3. Feed it through the metal holder/tensioner and then hold the yarn in your hand either up at an angle or parallel to the machine and let your hand control the tension (see the tutorial link above to get a visual example). You’ve got to crank the yarn at a decent speed. In that respect, I agree with Laura Felicia’s review, where she says that the key to using this machine is managing the speed and tension so you don’t have floppy yarn. You want to go at a good clip, not too slow. The Darice / Loops & Threads machine will hold about 4oz of yarn. It comes with a metal clamp that you slide into the back and then clamp onto a sturdy table. The clamp secures and stabilizes the machine as you’re winding. I was able to make four yarn cakes on the machine and it was a lot of fun!! In the picture below, you can also see the little turquoise ball I made from leftover yarn. Note: since this yarn winder holds 4oz, you cannot fit a large skein of yarn into just one cake. You will have to make two (more if you’re winding a one pound skein). The purple ombre yarn was too big to fit the whole thing on the winder, so I had to hand-wind the last bit of yarn. It was a partial skein, so if I was winding the yarn from the beginning, I would’ve made two balls of yarn. Some people like to use the smaller 4oz yarn winders just for leftover yarn. Others prefer to wind entire skeins into cakes or balls so that it’s easier to use while knitting so they don’t have to worry about knots or unwinding a skein from the outside. The winder makes center-pull cakes. The Darice winder is relatively small and portable and doesn’t have a lot of confusing parts. You don’t have to “assemble” it apart from sliding the clamp through the slot in the back so that you can attach it to your table. The box is relatively small too, so you could save the box it comes in for easy storage. Note: the winder is not quiet. It makes a sound very similar to a sewing machine when it is running. The sound is not an issue for me, but it might be an issue if you have an infant or if you like to do your knitting late into the evening when family members are asleep. Overall, I’d recommend the Darice / Loops & Threads yarn winder. You can find it at Michaels for around $29-$32 (less if you have a 40% off coupon). Amazon has it for around $23. I’d give it 4.5 stars for ease of use out of the box and the sturdy quality of the machine. I wish it could hold more yarn, but overall, I’m happy with my purchase. If you have a yarn winder you love, tell us about it in the comments. *Disclosure: I purchased this yarn winder and did not receive any compensation for this review. All opinions are my own. This post does include affiliate/advertising links.